At the very end of 2014 I supplied a 3-axis pre-assembled control loader drive to Western Air Spray in Canada. It was installed in their new Air Tractor simulator this year and Adam from W.A.S has sent some information and photos. I've just copied his notes below directly - I think many readers would prefer to hear direct from the system builder.... I've added a few of the photos into the text. 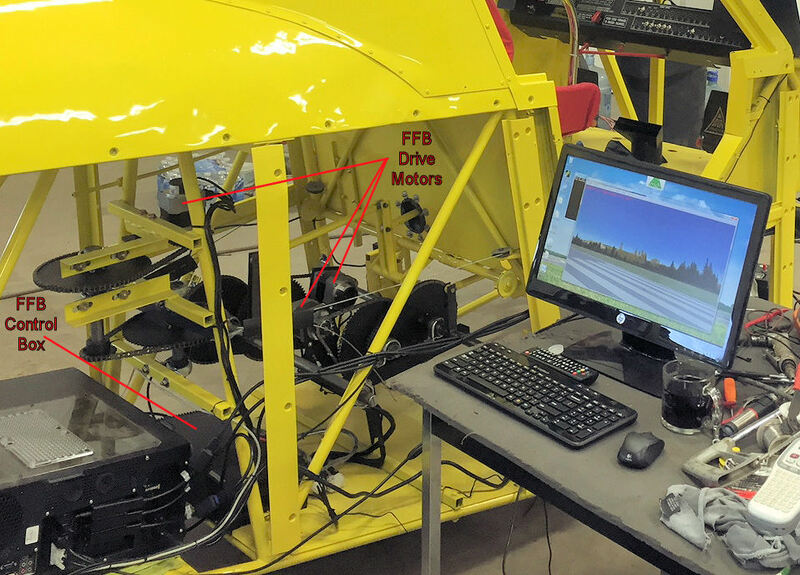 "We purchased your 3-axis pre-assembled system in the fall of 2014 for our Air Tractor Simulator project. We went with the pre-assembled system after deciding that we didn�t have time expertise or time to construct it from individual pieces. After receiving the assembled system we were impressed with quality and construction of it. After deciding to go with chain drives (for cost and parts accessibility) we got to work designing and installing the hardware. After almost 6 months of steady work and some long days we had it ready for a trial run. I read the instructions several times to make sure I wasn�t missing anything and we began to commission the system. We had a few minor issues getting it to work, but one quick email to yourself and it was sorted out. Once up and running we spent weeks fine tuning the system and getting the simulator to feel like the real thing. When were close to completing the simulator we trucked it to �Air Spray (1967)� in Red Deer Alberta for assistance with programming custom features and getting those to work with the Force Feed Back System. The programmer at Air Spray Michael Rowland is a genius with creating custom effects, control inputs and gauges. Things like making the aircraft pitch up abruptly when dumping the load, setting up fire retardant and spray effects, custom switches and an instructor panel. 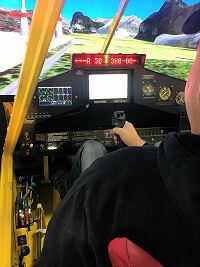 The simulator was then brought home and final touches were added like decals and panel boards. 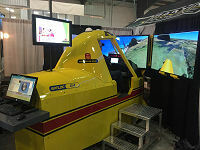 We have also incorporated a working GPS guidance system in the simulator to train ag. pilots. In March 2015 we finally had the simulator ready for the first trade show, we packed up and drove three hours north to setup in the arena. After doing a test of all systems we ran the simulator hard for 8 hours a day for three days. Everyone from small kids to retired seniors loved the simulator and we collected donations for a local charity. Everything worked flawlessly! Every night we checked all the rigging and controls for adjustment and had to make a few minor mechanical tweaks until everything settled into place. We couldn�t be happier with the Force Feedback System! It�s one of the best features we have in the simulator. We�ve had other Air Tractor pilots tell us how real it feels. The support we got from you was amazing, and even with the time difference I could always depend on a quick reply. A few notes: Looking at the project in hindsight we would have gone with planetary drives instead of the chain drives despite the cost, for simplicity and lack of maintenance. The chain drives we quite labor intensive to build, very sensitive to adjust and take up a lot of room. The chain drives however are incredibly strong, cheap to build and easy to get parts for. One side effect of having chain drives is that when the chains become loose or sloppy, it can cause an over control of the axis making the Force Feed Back system think it is out of calibration. Tightening the chains fixes this problem. The construction process was also lengthened by making the whole unit portable, but we are extremely happy with how it turned out. We used two 12 volt batteries to power the system, with a smart charger connected and charging at a constant 24 volt/ 2 amps. The batteries also power our GPS system and we have not had a single issue with this as a power source. We would recommend your system to anyone, we couldn�t be more pleased with the performance and operation of the system. The transformation Adam and his team made from the old disused airframe to the final fully operational training simulator is impressive; and in a relatively short time scale. I hope you have found it interesting. His comments on the chain drives are interesting also. 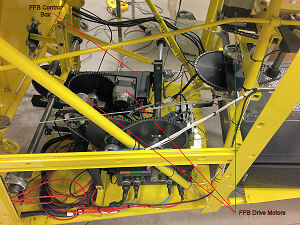 The alternative approach he considered was to use planetary gearheads directly fitted on the motors. This method is popular with builders and provides a compact way of achieving the required transmission ratios. But it is important to use good quality gearheads, with low backlash characteristics and smooth gearing, otherwise the force feel can be affected.